Grandview Independent School District general information and student achievement data at both district and campus levels are provided on this page. Also presented on this page are descriptions, pictures and maps of moderately priced Grandview ISD homes that currently are for sale. The ranking methodology used to identify school districts with best academic performance is presented on this 2019 best DFW school districts rankings page. The academic performance score provides a quick way to determine approximately where a school district's or school's student academic performance ranks among the performance of students in other Texas districts and schools. School districts and campuses with combined State of Texas Assessments of Academic Readiness (STAAR) and college readiness indexes ranked in the top ten percent of Texas school districts and schools are awarded an academic performance score of 10, districts and schools with combined academic performance indexes in the ninth decile receive a score of 9, and so on. Grandview ISD was joined by 11.9 percent of all Texas K-12 school districts in being recognized by the Texas Education Agency (TEA) with an accountability grade of A, the top grade awarded in 2018 to school districts. The Grandview Independent School District operates one elementary school, one middle school and one high school. These three schools are attended by approximately 1,200 students who reside in Grandview. Grandview ISD's 2018 TEA STAAR component scaled score is 90. As is further explained in the Texas Education Agency 2018 Accountability Manual, the STAAR scaled score is calculated by first adding equal weightings of the percentage of assessments on which students’ performance mastered grade level, met grade level and approached grade level, dividing the sum by 3 and rounding it to the nearest whole percentage. This raw STAAR raw component score is then adjusted or “scaled” by using a conversion table to align accountability letter grades and scores of Texas public school districts and campuses. 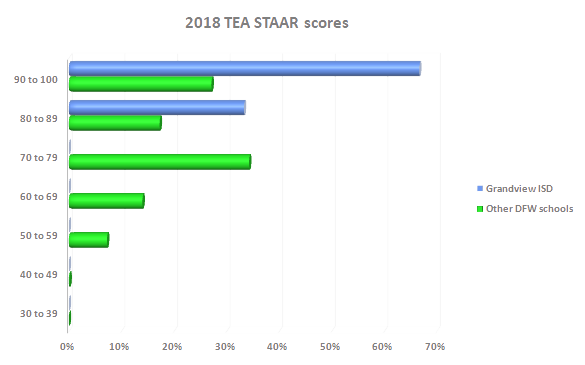 As depicted in the 2018 TEA STAARS scores graph (right) and shown in the Grandview ISD schools table (below), two Grandview ISD campuses attained TEA STAAR scaled scores between 90 and 100 and one Grandview ISD campus had a STAAR scaled scores between 80 and 89. Shown below is a typical website presentation of currently listed homes that are more or less in the middle of the Grandview ISD single-family homes price range. A similar presentation of all currently listed Grandview ISD single-family homes is available on this Grandview ISD homes for sale page.